There was pandemonium at an MDC-T report-back meeting in Victoria Falls last Friday, as more than 400 party members fought over food, as hunger stalks most parts of the country. The meeting held at Ndlovu Business Centre had been organised by district chairperson, Thembinkosi Sibindi. MDC-T Nkayi North deputy organiser, Fiso Sibanda confirmed the chaos, but blamed party youths for coming to the meeting drunk. “We want to take down all the names of youths misbehaving. Some came here drugged to cause chaos and fight for food and all that will not be tolerated,” Sibanda said. A 72-year-old Chidobe villager, Linah Shoko, said the stampede for food was symptomatic of the severe food shortages in the district. “I don’t have an option, but do this. My four grandchildren are starving and that is the reason I came here so that l get supper for them,” she said. “People at the high table are clean, that is why you see many people scrambling for their left over plates, plus the food they are served is of better standard,” she said, as she packed the leftovers into a bucket. “I have two minor grandchildren that I’m looking after. Their mother died in an accident last year. I packed my food in a lunchbox so that we eat together at home together with these left overs,” he said. Zimbabwe is among several Southern African countries that have been hit hard by El Nino-induced food shortages due to erratic rains. About three million people are said to be in need of urgent food aid throughout the country. The government, last week declared the current drought a national disaster paving way for international donor agencies to mobilise food aid for the country. 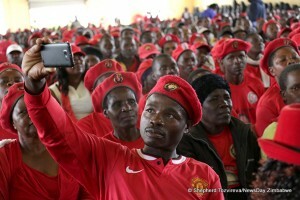 Opposition supporters have often accused Zanu PF officials of denying them food aid in favour of their party supporters.